Kass Hall and I speak to one another through Facebook, she is also a (4 time) cancer survivor and she has written a book, soon to be published about Zentangles, called Zentangle Untangled . 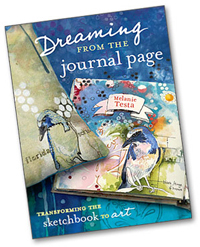 Kass recently wrote a review of Dreaming from the Journal Page on her blog. Then she went and wrote this post. To which, I am nonplussed. Really? But my thing is, if in doubt, paint something. If my mind is filled with negative, start a project and focus intently on it until reason prevails. Fear will always beckon, it’s the ‘frenemy’ you wanna shake and can never quite release. So, why give the mind a chance to settle in that place? And I am not saying that writing a book while going through treatment for breast cancer, or any cancer or sickness, is an easy thing to do, not at all. Maybe I am grateful that I have cultivated the wherewithal to apply art to major life experiences-no matter how challenging. Where do you find courage and ability? Are you one of those who might curl in a ball and sleep? I find courage in the making. Painting, drawing, sewing, it fortifies me. It reminds me that I have ability and can push myself further. It reminds me that I want to be better, live more, extend myself to the limits of possibility. To have my life threatened by a disease and to know that my lease on life is tenuous at best? That seems like courage to me. Or at the very least the impetus to be courageous. At the same time, I often feel like Kass, I know what I want and the steps I need to take in order to make my goals acheivable, but I freeze. Are you frozen? 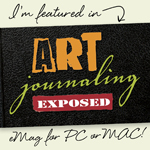 Do you apply art to necassary situations? How do you cope with challenging circumstances? Kass and I would like to know. I love this post. It really made me think. Yes, I think you are amazing that you could write a book through all this. I used to say that there is no way I could have done the same thing. But you know what? I did manage to do my job and do it well throughout the lousy days of surgeries, radiation and chemotherapy. I ran my business, I packed and shipped orders, I kept up with inventory and organized and placed wholesales orders. I was diagnosed the SAME day our Stencil line was released to the public. And it’s been doing really really well. And everything was done during my illness. Where do I get the courage from? It’s just inside of us I think. Sometimes I get irritated when people say “you’re so brave!” Really? Do I have a choice? What other choice do we have than to be brave/courageous? Curling into a ball and giving up on life is NOT an option. Especially when we realize how much our precious hold on life has changed, and our priorities have changed. I don’t know.. maybe I’m brave but it’s not a choice for me when there’s so much life to live and lives for live for. P.S. I LOVE the baldy picture of you. You’re beautiful! I am right there with you, Lisa, thanks for posting. We have no other choice. I don’t think I was brave, I think I turned off the fear and went on autopilot (as far as the diagnosis went), what other way to get through an awful situation? I find that now, I am coming back to myself and every now and again I think, ‘Wow. That sucked’. And then I think, thank god for that book contract! Excellent post and thank you for introducing me to Kass’ blog. I love her writting and art. I know I was one who marvelled at your resiliency. It wasn’t so much the diagnosis (I knew you were a fighter), it was the abuse your body was going to have to endure. To be able to get up every morning after treatments and create is not something a physician would expect and I was in awe (and proud). Head people claim there are 5 stages of accepting a diagnosis, much like the stages of grief – denial, anger, barganing, depression, and acceptance. We all move through the stages at our own pace and some get stuck along the way. Getting unstuck requires some effort on our part. As you know, I deal with pain every day. There are days when the pain wins. I could focus on those days and have them define who I am.I have chosen not to live that way. Dystonia is a condition I have within my body. It is not who I am. Sure, it does ruin plans, limits activities, and is not something I would wish upon my worst enemy. But, I if I focus on only the pain and what I can’t do, I wouldn’t get up in the morning. I choose to focus on the gift I have been given. That is to appreciate the good days, to celebrate a day with little pain by doing what I love not what I “should” be doing. I have learned to live in the moment (really hard for a control freak like me) and not worry about tomorrow or next week. Carpe diem has new meaning for me. I think I have become more experimental and challenge myself to embrace the artist within me since my diagnosis. The critic is just an irritation compared to a bad day. LOL! Jeannie, you said: Dystonia is a condition I have within my body. It is not who I am. At my weakest, when the chemo was taking its toll, my Mom was here, bearing witness, I looked at her and said, I am not ill, I am taking medicine to rid my body of cancer. Now I can look back and embrace how ill I was, but at that moment it felt so good to brush it off. And now that my body is cancer free, I certainly do not want to identify with or create a persona related to being a cancer survivor. That is part of who I am but not a simple definition of Melanie Testa. Beside, I don’t just survive, I thrive. I live, well. For 21 years I have been, to so many people, the “sick” one or the “one who beat cancer”. My mother pretty much sees me that way and I guess since I was 12 the first time, has never fully moved on from my being her “sick child”. Unluckily cancer hasn’t permitted us to keep cancer in my past either, and I think this goes a long way to explaining why I often feel so paralysed. I have fought tooth and nail to stay alive simply so I can be someone other than the sick one or the cancer survivor!!! I have tried to be be and do so many other things. I think I am so many other things, but it is hard when others cannot see past the scars, the pale skin, the memories of hospital rooms and doctors visits. Every day I want to be someone other than the cancer survivor but some days – gosh I can’t believe I am about to say this out loud – some days I wonder if I actually know how to do anything else except that? Isn’t that awful? It feels selfish and ridiculous to say even! I’m experiencing some family dramas right now (I’m spared none of that in all of this!) and one of the big problems between me and my dad and sister amongst many) is that neither of them ever expected me to survive that first time. I’ve done it 3 times since and I actually don’t think they know how to cope with that, what to make of it. Most families would be proud right? For mine it hasn’t been pride, it’s been “well what do we do with her now?” and instead of fostering relationships with me post-cancer, they sometimes look at me like I’m a ghost. I don’t for a minute think they wanted me to die, but I don’t think they really know what to make of me alive either. Does that make any sense?? My dad especially, he offers little to know help or support to me, cancer wise or any other wise. I think he thinks that if I have survived cancer then all other problems miraculously fall away with it. It’s very odd. Anyhow these are the rumblings of a tired Aussie girl at 1am with a couple of apple ciders under the belt. Best I sleep!!! It’s a tough question, I’d like to think I’d keep going full steam ahead, which I probably would… Part of me thinks I could easily retreat inside… drama of any kind, and I run away and into myself and my creative space… I force myself to get out there… at the same time, since I have not been faced directly with something so life threatening, in a long while, I have, when other people are sick, go into full steam mode. I focus on each day being a gift, so I hope I can pull myself up by the boot straps and forge ahead if life deals me that card. 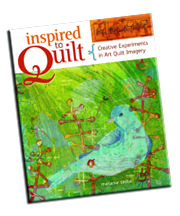 Writing a book through it… not sure… maybe not about quilting, but maybe everything I’d want to tell my kid.. OK, that made me teary. By the way… You did a GREAT job. Your book is so beautiful. I have thrown myself into my art projects when stressful life situations strike. For years it was cut lots of strips of fabric and piece them together, just cutting and sewing on and on until my courage came and I could deal with whatever “calamity” had befallen my life. It worked, man it worked, and then I donated many of those quilts to either nursing homes or to abc quilts or to Ronald McDonald house (those came with a tote bag for the Moms with a journal and pen and some treats to help them during the long hours of waiting and worrying). Of late it’s writing and painting. I have never considered curl up into a ball a particularly useful way of dealing with the problems life throws at you either, quite the opposite actually. I have also learned a great deal artistically from the series begun in such periods, when you just HAVE to do the art or go mad, interesting new pathways frequently open in the creative side of your brain. Melly I’m so glad you took the art approach and are here to bear witness to how art can help you to deal and heal! You know, I think the bottom line is that we need to Choose Quality of Life over content. 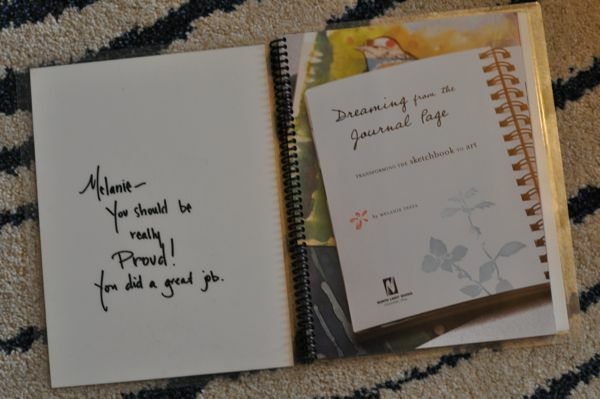 I recently spoke with my Mom about how proud I am to have writen Dreaming from the Journal Page at this time in my life. I said, I sure did make some lemonade, and this is just it, Like Jeannie and Alena, we just need supportive, helpful and positive distractions. Very inspiring ladies! I don’t know what I would do in a situation similar to yours. Art might be a way to distract me and to relieve stress (?). I have a family as well to take care of and I know that would certainly make it necessary to NOT crawl up in a ball. Sometimes when I am overwhelmed, I create a list and just slowly begin to wade through all that I have. Wishing you good health and continued strength! I have to admit I’m one of those people that said I think I would crawl up into a ball and sleep. And actually I think I would – well at least for a day or two or until the kids came home from school and then I wouldn’t have any choice but to get up and go again. In fact that is what I’ve had to do. The last 10 years have been a little rough at times – My parents died within four months of each other (they were only 59 and 68) – I had thyroid cancer, multiple mini-strokes, a hole in my heart, multiple surgeries for other stuff, as well as children growing up and graduating from grade school, high school and college (two still in high school now), and my husband had to change jobs a few times, which meant no insurance. Yikes. When I write it all down I wonder how I have survived it all! It is amazing I haven’t crawled up into a ball and slept away those years but amazingly I have woke up every morning and done something. 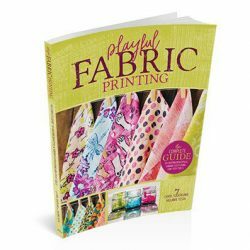 Reading fabulous books and websites like yours and learning new skills has kept me going. They have kept my spirits up and allowed me to keep moving because sometimes “being brave” is just moving when everything tells you to sit down, crawl up into a ball and sleep. Thanks for sharing your experiences this past year Melly! And now on another note – you are now the EVIL ONE causing TROUBLE!!! I LOVE ZENTANGLE! I was introduced to the thrill of drawing zentangles this year and now I MUST buy Kass’ book and play even more. You are such a trouble maker! Love ya! Small world, Melly. I just met up with Kass while I was in Australia after having met her there last year. She is a wonderful, wonderful brave woman, as are you. I never blinked when you went ahead with live. I knew you were brave and able and an inspiration to us all. Now let’s schedule that interview…. The older I get, the less I think I am one type of person or another. I have crawled up in a ball and then I have gotten up and gotten through the day, the week, the month, the year. I think it’s bravery from the outside. On the inside I think it can be coping, dealing or just living. I am less inclined to put a brave face on things since I’ve learned how much I need caring and support, but also less likely to want to indulge in the drama. I get so bored of myself. But if I could cultivate one quality, it would be grit. To me, grit is doing what must be done with grace of spirit. I think often when we compliment another person, we use a simple word, like brave, but we mean something more complex. Maybe it is a reflection of the hope that if we were confronted with a horrific ugliness, we could continue to focus on the creation of beauty. Some of the most challenging circumstances in my life have been my husband’s 6 month deployments with the Navy and our many many military moves. I’m not sure it’s fair to compare that to cancer, but these are also the kind of situations when people respond with “I just couldn’t handle it!” “I don’t know how you do it.” “Ug. I’d just go live with my parents for 6 months.” Or your example… curl up in a ball and sleep. Those responses can seem a bit dismissive — both of the resiliency of the person speaking them, and of the reality of what it must *really* mean for military families to face such loss and disruption. Have I leaned on art in these challenging times? Of course. During my husband’s deployments I filled lonely, stressful and complicated days with art. One of my favorite quilts was spread out all over the dining room table the entire time my husband was away. I even put the name of his aircraft in the quilt’s title. My other go-to coping mechanism is to just look ahead … in the midst of a crazy move, I always tell myself, “We’ll be settled by Christmas (or the first day of school or springtime or whatever).” You were probably doing that a bit also, even in the midst of trauma and deadlines you knew beautiful boxes of books would be delivered in the springtime. Maybe most important during challenging times, I also really enjoy and embrace the people I love and who love me. Thankfully, I take them along with me on my moves! When it comes to cancer, you and I are completely on the same page. For 21 years now, I have had people say I am brave, courageous, gutsy……all the adjectives. I have never felt especially that way about myself. Sure, I can recognise that I did NOT curl up in a ball and sleep it away (well, maybe a day or two here and there but that’s allowed!). I have always got up, got on with what had to be done and kept life as normal as possible. I remember when I was in 7th grade and I was diagnosed the first time, I refused to be held back the following school year. I had chemo going in one arm and was doing Japanese and maths homework with the other. I came 3rd in my class for Geography after missing 3/4 of the semester. I’m not brave, I just don’t want to die yet. No doubt, Melly, you felt the same – I mean, that’s not even a decision, is it? You just do it. And when it comes to cancer, I am all about doing that. And you’d be surprised to know how grateful I am that cancer came into my life – the people it brought, the perspective, the opportunities. I guess being alive after 21 years of it allows me to think that way! I guess my fears about now moving forward with my art and business is that I just need that nudge. Maybe I should treat it the same as my illness – just do it and quit overthinking it. I don’t know what is holding me back (other than the inner critic and a couple of external ones too). No luck getting chemo to kill the inner critic huh?! Whatever the case, you are a star. Your courage and ability to write your amazing book is so inspiring to me. I KNOW how much work goes in, how hard some days just the book writing is. Some days I didn’t want to do it but I dodn’t want it to finish either because then I didn’t have anything other than cancer to think about and I didn’t really want to do that either. Art is always the better option! And I am going to take some more inspiration from you and just go and DO something. Anything. Kass, I think we are in very similar places, it is almost as if, after writing the book, creating the web site, content, online classes, I keep asking myself what next. How to make the next step? I think it is just like before, break it down into manageable parts, do a little bit every day, keep trying, but rest too. Remember to breath and relax. Alena, I am sorry your body is challenged. I have an idea of what that is like, though one can never really know. I pray that you will keep pushing and find a place of comfort where you can make things and soothe your soul. Melly, you have inspired me in ways you will never know. I think I pointed out a quote of yours once before about experiencing trauma and choosing to give beauty back which has really impacted my attitude. I dive deep into depression, not by choice. I’ve done it since childhood when I couldn’t have told you what the word meant, it’s the gene pool I dipped in. When I am really depressed I bow ,out of most of my life. I used to sleep through it, I mean for days in a row sleep. Thank god for antidepressants! Watching you over the past year has been a lesson in grace under fire and while you surely had your moments of feeling less than graceful, we never saw them from the sidelines. I think now, too, that I have better tools for coping because of people like you, and the sketchbook challenge community, so that I would more quickly turn to painting or drawing as a “depression exit strategy.” The more art I make the more I want to make and the happier I feel for having made it and the joy spills over into the rest of the day. A million thanks are not enough for how you have helped me find a way to open the door to such joy. I love your note to you. Excellent. There was a time in my life when I probably would have curled up in a ball if I had been given a diagnosis as serious as yours was. But I have come to realize that as short as life is, we can’t afford to waste one precious second letting fear rule us. Having said that, you were still incredibly inspiring to me (even before your diagnosis!) during your illness and treatment. My opinion is that the book contract was God’s way of giving you something to get out of bed for every day… there was a reason you were asked to go through the ordeal of life-threatening illness AND write a book to share your creative gifts! You got to show us all that we can overcome huge obstacles and shine in spite of them! I have been reading your blog for quite a while, as I met you at a Hampton Art and Soul a few years back. I received my breast cancer diagnosis while I was preparing to expand my fledging quilting and sewing shop and was building out a new space. I was fortunate to not need chemo but had my first surgery The day before my new shop opened and couldn’t be there to turn that key the first day. Seeing how artists like you push forward and continued to create was always an inspiration. I, too, never said I was ill. I used to say I had ‘rogue cels’. The best way to get through everything was to surround myself with creative people every day. I didn’t waste my time with toxic people who wanted to talk illness, I wanted see everyones creations and help them choose fabric, talk color. It was so uplifting to absorb creative energy when I may have been lacking some at times. Thank you for inspiration. Don’t you think there is a book out there to be written for healing through creativity?!! Today I am leaving for Alhambra, CA to participate in a silent retreat. This year, I will be saying Thank you to God for walking with me through the valley of beast cancer. Last year at this time, I went to pray for successful surgery and strength to deal with whatever came my way. On May 20th it will be a year since my first surgery (I ended up having 4). When my symptoms first appeared I had a historic meltdown. You see I live alone. My Husband died in 2001 and my daughter and son live 2000 miles away. So I had this oscar winning meltdown with no one to witness it but God. It took about 4 weeks to get the result of tests and the waiting was excrutiating; however, once I heard the words You have Cancer, a calm came over me that is hard to describe. All I asked was can it be treated, when Dr. Spotts said yes, I said, well let’s get busy. I decided to spend my time of healing and treatment creating. It just seemed that art would be my savior and keep my mind on positive things. Once I could move around, I went to my monthly Greeting Card making class, I made thank you cards for friends and relatives. I crocheted a baby blanket for our church charity, I made liturgy squares for quilts that are part of our Peicemakers prayer quilts at my church, and I ordered a boat load of cool art supplies. I found that prayer helped me a lot, so when I lay on the table for radiation (I had cancer in both breasts so it tood 20 minutes), I would say the rosary and pray for people who were in need of prayer. I used my fingers as rosary beads and on most days I could get though 3 to 4 decades. On the days when I was scanned, I got through all five. I tell you that made such a difference. I truly believe that a positive attitude helps you to heal, along with the comfort of God embrace. Thank you, maybe I should concentrate my heart on others and my drive will come back. Good luck, it sounds like you have the right idea. You can be surrounded by people and still feel very much alone. I do not know if this has already been said, but it seems to me that the creative person has built in courage, because she or he MUST be courageous to create! Is that a bit backward? The ability to be creative is in us, but it takes courage to let it out at all, to dive into it every day, to share our work with others, to seek HELPFUL criticism, to RISK rejection, to follow our hearts, to do what WE design, dream and suffer through. I am not certain that I can say that it logically follows, but the thought occurs to me that perhaps creative people, who are courageous every day in their art, may be better equipped to deal with fear producing illnesses or overwhlming circumstances then others who do not see themselves as brave/couragous/creative, synonomous to me. Melly, the cancer and the book contract gave you a could-have-been-daunting opportunity to be brave on several fronts at once. I have not yet held your book in my hands, but am looking forward to doing so. I find myself inspired (again! )by your attitude. Melly, you approached your cancer diagnosis with a fierce attitude right from the beginning. Not once did you allow it to define you, rather, you defined the terms of the battle. I suppose one never really knows how they will respond to such a diagnosis until faced with it. I can only hope that I would be able to pursue my passions in a similar way. I’m so glad I have the honor of being your friend. I almost hesitate to comment because while my family has been struck repeatedly by the beast called Cancer, that is one battle I have not fought. I’m not sure how I would react to a diagnosis of cancer (and I don’t think one can truly know that until it actually happens). I can relate, however, how I handled my particular situation: I have a few other ongoing health challenges but in 1999, after ten years of mystery, I was diagnosed with a rare bone disease in both wrists that was causing the bones to die, collaspe, and shatter. (This actually is fairly common in other joints like hips but not so much in wrists.) Eventually, I had to have my left arm shortened and my right wrist completely fused. The surgeon (top in his field but with the personality of a turnip) told me I’d never do art again. Suffice it to say, that bum wrists and all, I am busier than ever making art. Are there hard, even impossible days? Yes. Do I have moments, even days worth of doubt, self-pity, and fear? Absolutely. But I just keep putting one foot in front of the other, even if those steps are teeny tiny. That is all I can do. And what do you know? All those small bits of forward momentum do add up and when you least expect it, you look up and discover you are on the other side. Thank you for this discussion as it is ever so helpful to remember what works when times get tough.